Cantley, Que. 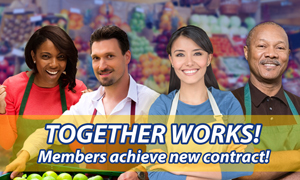 – January 15, 2018 – UFCW Canada Local 500 members working at the IGA grocery store in Cantley, Quebec have ratified their first collective agreement. Under the new three-year contract, the employer will contribute to the UFCW Quebec Dental Plan and cover 80 percent of members’ dental expenses. The agreement also provides sick leave for regular employees, a floating holiday for all workers, and premiums for checkout supervisors. As well, workers at the top of the wage scale will enjoy a 2 percent wage increase. “The retail food sector is going through major changes right now,” says UFCW Canada Local 500 President Antonio Filato. “However, by joining an international union that has long-standing expertise in the grocery industry, the IGA Cantley members are now in a much stronger position, and we are very proud of this first collective agreement,” he adds.